Holidaymakers who enjoy organised watersports need to be careful about who they trust their safety to if they want to spend longer in the sun than in casualty. A recent report found that half the beach watersports operators investigated were putting their customers in potential danger with substandard operating procedures and equipment. Many were found to have a total disregard for their customers’ safety. Each year this lax attitude leads to a troubling tally of tourist fatalities. Unfortunately at present there is no European-wide legislation relating to the responsible operation and management of watersport businesses as well as beach regulations, standards and guidance. Tellingly the few individual countries that have imposed their own laws – and usually in the aftermath of an accident – have largely been greeted with a positive effect on the actions of hire operations. From the heady thrills of paragliding to the splashing insanity of banana boats, watersports are a great way to keep amused on holiday. But they each have their own risks, and every tourist should make sure it is the operator that is bearing the risks and not themselves. It is important to take the time to look for the right operator. These should be organised and professional looking enterprises, and not one-man operations. If a watersports centre does not look after its equipment then it is unlikely it will be too fussed about looking after its users. A responsible and well-maintained beach watersports operator will be all too aware than the sun, sand and salty seawater are destructive to their expensive equipment, and will make sure to routinely rinse it in clean water and store it out of the sun. An old looking, scuffed and sun-bleached lifejacket is a good indicator that an operator does not take the safety of its customers very seriously. The one universal safety item is the lifejacket or buoyancy aid and so should be provided by the operator whatever the activity. It not only should be in good condition but the watersports centre should make sure that it fits comfortably and securely on its user. If it is too big or too small, for example, it cannot do its job correctly, and as such is a waste of time. The operator should maintain an organised and clearly designated lane on the shoreline for launching and a buoyed area in the water. These zones should be large enough to prevent their customers from coming into dangerous conflict with other water users. In case of accident, the watersports operator should always make a record of personal details such as name, accommodation address and any relevant medical conditions. 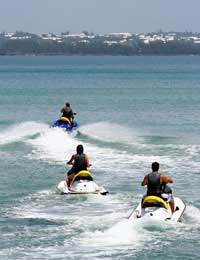 For certain more advanced watersports, such as jet-skis, the operator should ask for ID and proof of age and qualifications or training. All participants should be given the appropriate safety briefing and asked whether they feel confident in deep water. There are numerous aspects to look out to check whether the watersports operator has safety concerns at heart. If the answer to any of them is no, then it is wise to be very wary. Is there somebody keeping a look out over the water at all times? Is there a spotter, in addition to the driver, keeping watch in the boats towing inflatables or water skiers? Is there a designated safety craft with staff driver at the ready in case anybody gets into trouble? Does the boat driver use a ‘kill cord’ to cut the engine in an emergency? Look out for safety equipment at the beach base and in the rescue craft. Is there a pair of binoculars, a first-aid kit and a VHF radio, for safety communication between base and drivers?